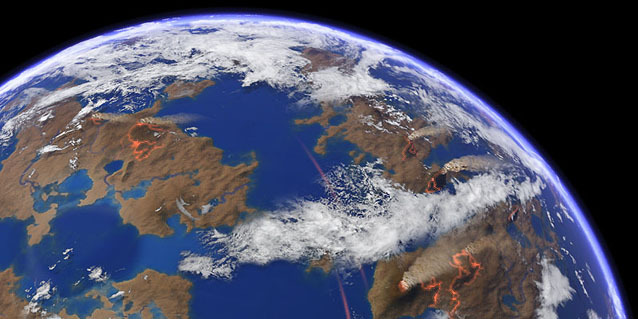 This simulation imagines what the Earth may have looked like early in its history, with the first continents emerging from the ocean amid widespread volcanic eruptions. The surface still bears the scars of the period of heavy meteorite bombardment and the process of crustal rifting is just getting underway across parts of the seabed. Plants have yet to colonise the land, which is just bare rock and sediment, crossed by lava flows, rivers and lakes.